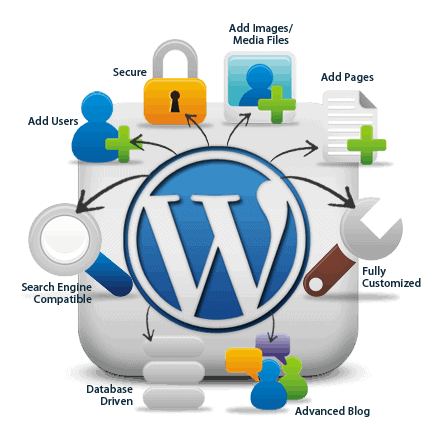 When it comes to content management systems, WordPress is by far the most commonly utilized in the world. It started as just a blogging platform, but has evolved over the years into a versatile CMS for all marketing needs. The intricacies involved in unlocking everything WordPress has to offer can be complicated and costly for web administrators. Our team helps you take full advantage of its adaptability and scalability. WordPress may be the world’s most popular CMS, but that doesn’t mean things can’t get complicated, that’s where we come in. Whether you’d like a custom, personalized theme for your existing WordPress site or want to create a new web property from scratch, our team helps streamline the user experience and simplifies site management. We maximize the WordPress experience with graphics, system integrations, regular maintenance and whatever else is needed. Let our designers and developers make your WordPress site the talk of your industry. We assign you a personal web design specialist who works with you throughout the entire process, from drawing up mockups to launching the finished product. The specialist keeps you up-to-date on progress, answers all your questions, discusses strategy, and incorporates your ideas and feedback pertaining to the project. We bring your ideas to life no matter how simple or complex. Nothing is impossible when imagination and innovation work in conjunction with one another. You want members-only premium content areas? How about commenters having the ability to up and down votes other people comments? Whatever the goal, our design specialists make it happen. Forget using some cookie-cutter theme with no updates or customer support. We’ll build custom, personalized themes that incorporates your visions and sets your apart from the competition. The original intent of WordPress was blogging. Now that more people are using it for standalone websites, problem such as plugins glitches and slow page loading occur. We diagnose and remedy these issues. The WordPress platform, along with all the plugins, widgets and themes, are frequently updated. Our services includes ongoing maintenance and upgrades to ensure your website is always running as smoothly as possible. There are millions of plugins currently available. But that one you’re imagining for your site doesn’t seem to exist. Our team listens to what you want to accomplish and develop the plugin for you. Whether we built your WordPress website from scratch or improved your existing one, the goal remains the same. Any problems you were having before we got involved and thereafter are identified and resolved. The world’s most popular CMS offers more than meet the eye. Many companies are already using WordPress for their websites. We’ll help you optimize your existing site or create a custom theme that provide your brand a unique look and feel online. WordPress is a fairly straight-forward CMS, but has many features and intricacies that go unutilized due to limited technical know-how or just being aware of its deeper attributes. Contact us today and we’ll show you how to generate more leads and convert with the WordPress CMS.